Westminster Bridge near the Houses of Parliament is the ideal spot to start a quickie tourist visit to London you can get your bearings from this bridge over the Thames River. There’s plenty to see and d in London. Here’s a list of what you can realistically cover in a three-day break. 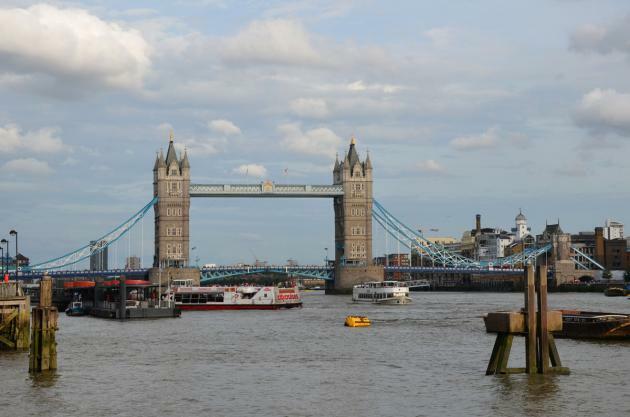 London is one of the most-visited cities in Europe, attracting 17.4 million visitors from abroad last year and boasting enough attractions for a three-week stay. Yet many people come for just three days. There is more than enough to see and do. But it takes some discipline to tick the boxes in only three days. The following is a blueprint for a three-day visit. The tourism hotspot and ideal starting point to explore the city is a bridge. 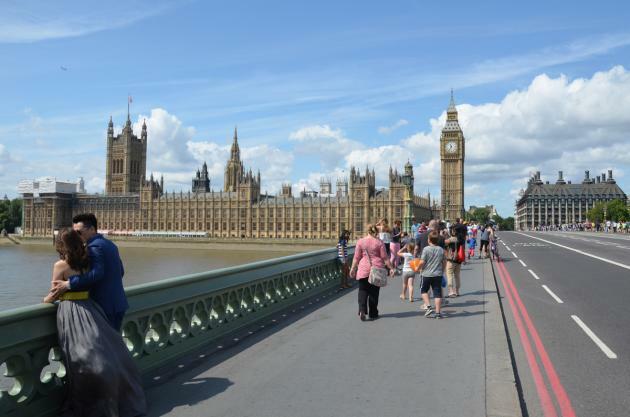 The whole world meets up at the 250-metre-long Westminster Bridge. Here you’ll probably see a Chinese travel group led by a woman signalling with her black umbrella, or Indian newly-weds having their picture taken a few metres away by a photographer, with the Houses of Parliament in the background. A Scotsman in a kilt might be playing the German folk song, “Muss i denn,” on bagpipes. The giant ferris wheel London Eye is one of the newer tourist attractions. A ride on it is more meditative experience than adrenaline kick. The cabins move so slowly you hardly notice they are turning at all. One time around takes 40 minutes. 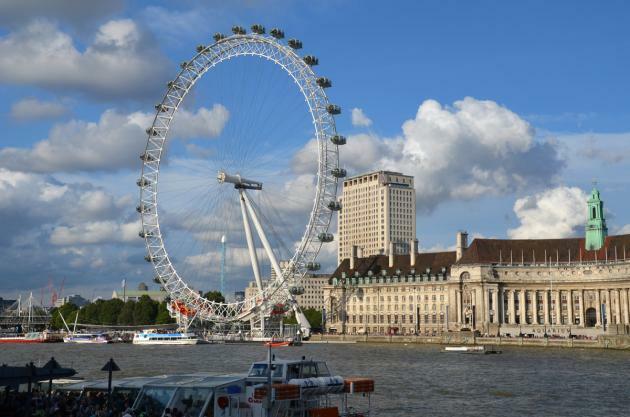 While taking the ride, you’ll get a good view of the dome of St Paul’s Cathedral, and then suddenly you’ll be at eye level with the face of the clock on the tower of Big Ben at Westminster Palace. That’s the point when the smartphones are pulled out and people start taking selfies with the huge tower in the background. This should be a day for the classics. One of these is the Horse Guards, the soldiers sitting atop horses and guarding the entrance to Buckingham Palace. Except for the changing of the guards at 11am – an hour earlier on Sundays – there is not a whole lot going on there. The uniformed soldiers with their white gloves, shiny breastplates and equally gleaming helmets are not there for a chat. Selfies in front of the Horse Guards are highly popular. Those in a hurry will hustle directly from the Horse Guards on over to Buckingham Palace. But such haste can be tiring. Much better is to take a break the way many Londoners do. The lawns of St. James Park are there for relaxation with deckchairs to rent. And as long as it is not raining, there is a lot going on there every day. After a break, stroll to Great Russell Street and to the mother of all museums, the British Museum, where to this day entrance is free of charge. The first crowd of people will be found in front of a display case on the ground floor admiring the Rosetta Stone, which scholars used to decipher the Egyptian hieroglyphs. Today, the Rosetta Stone is just one of thousands of items of world-class renown at the British Museum. To try to see everything would be madness, or better stated, impossible. Just the special exhibitions are interesting enough. This should be a day for contrasts. Oxford Circus is the ideal spot for shopping junkies to get off the bus. This is where Regent Street and Oxford Street, London’s two most important shopping streets, intersect. It is said that nowhere else in Europe is so much money spent as on Oxford Street. That may be. And nowhere else is there so much traffic. There is an enormous choice of department stores, franchises and fashion shops and labels to choose from – everything from discount places like Topshop to the largest single store of Marks & Spencers to the classic department store Selfridges, which also features the largest men’s shoes department in the world. After so much shopping, those needing to clear their minds are best advised to head outside the city a bit into some greenery. A good destination is Kew Gardens, the royal botanical garden. It’s very British: female visitors like to show up in flowery dresses and a large hat. The gardeners get around on small black bicycles because the grounds are so huge. Some 120 hectares are home to around 40,000 plant species. There are beds and beds of sumptuous roses, and greenhouses with plants from around the world. The palm house built in 1848 is the place for tropical plants including lush mango and fig trees. One of the oddities of Kew Gardens is the constant roar of the low-flying planes on their way to land at an Heathrow Airport some 5 kilometres away. This is disturbing on at least two levels. First, because plane noise is so out of place in such a lovely setting. And second, because it is a painful reminder to the tourist that the time for the return flight home is getting nearer.